Ship Shape Elementary: Apple Week and a bunch of Freebies! Apple Week and a bunch of Freebies! Hey there. Thank goodness it is the weekend because I am all but wiped out. 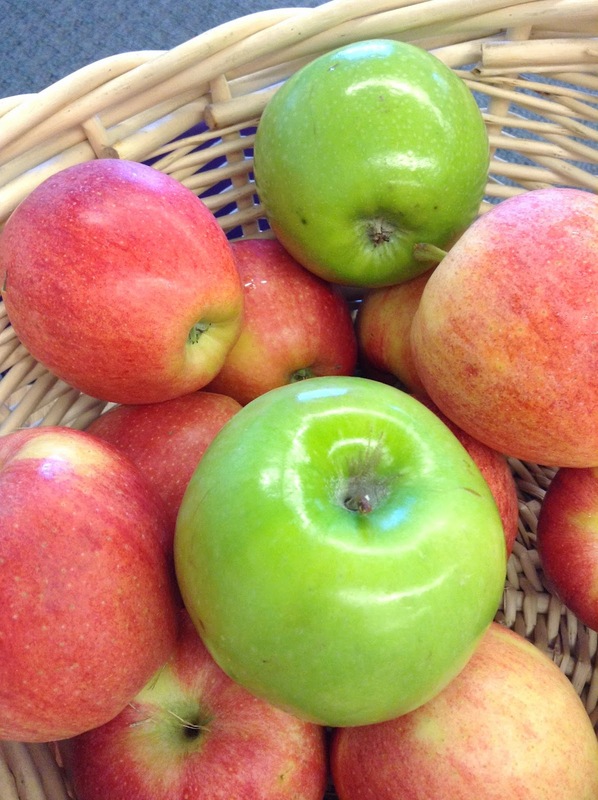 We've had all kinds of apple fun this week in first grade and I'm excited to share some of our fun! We started with a K-W-L chart. 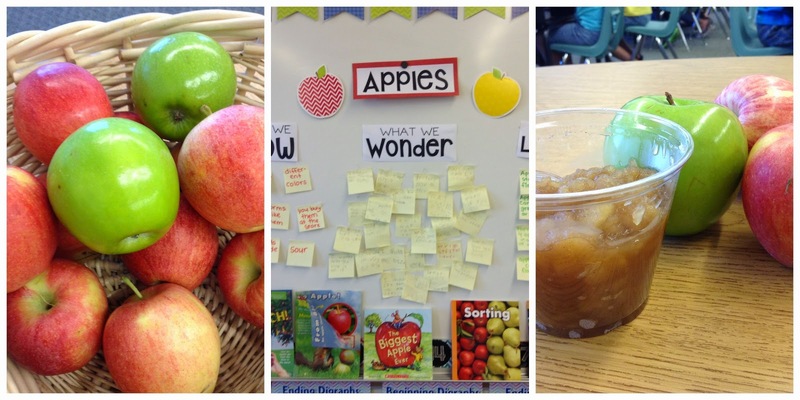 We did the "Know" and "Wonder" portions on the first day and added sticky notes to the "Learned" section throughout the week as we discovered new things about apples. 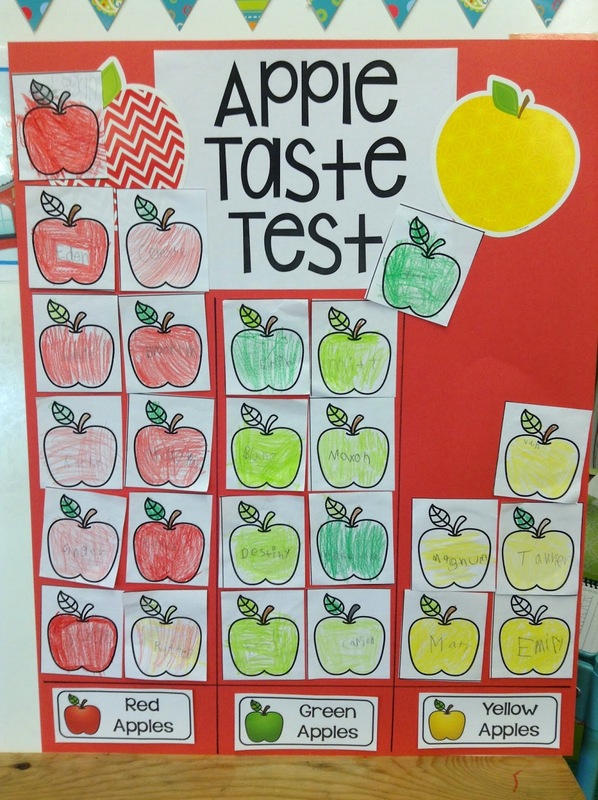 We had an apple taste test to see if we liked red, green, or yellow apples best. I gave everyone a little blank apple to color to represent their favorite variety. We glued those up on our graph. It was very exciting watching those apples rise up to the top. There was chanting throughout the room "Red. Red. Red." In the end red indeed won! This was our first experience collecting and graphing data and we had a great discussion about how this represented our preferences. 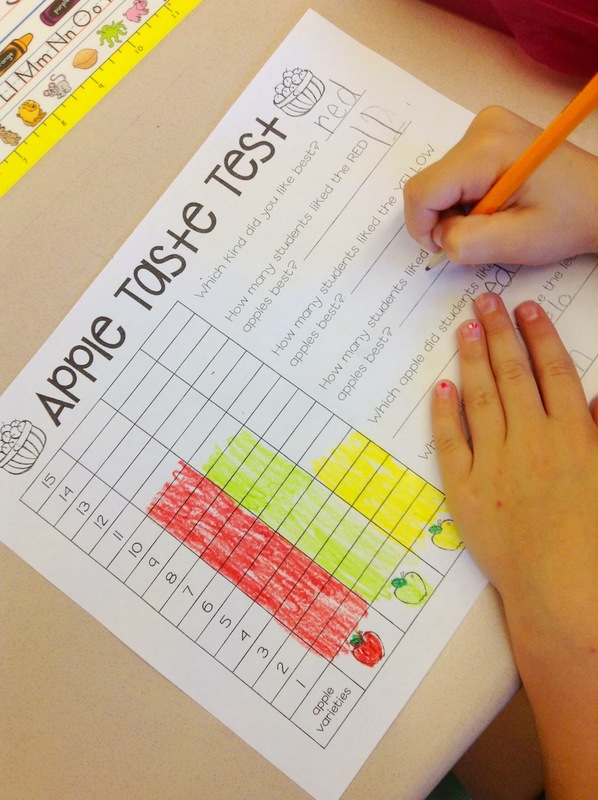 The students graphed the results on their own smaller graphs and answered a few questions about most and least. You can grab this for free right here! We then began investigating apples. 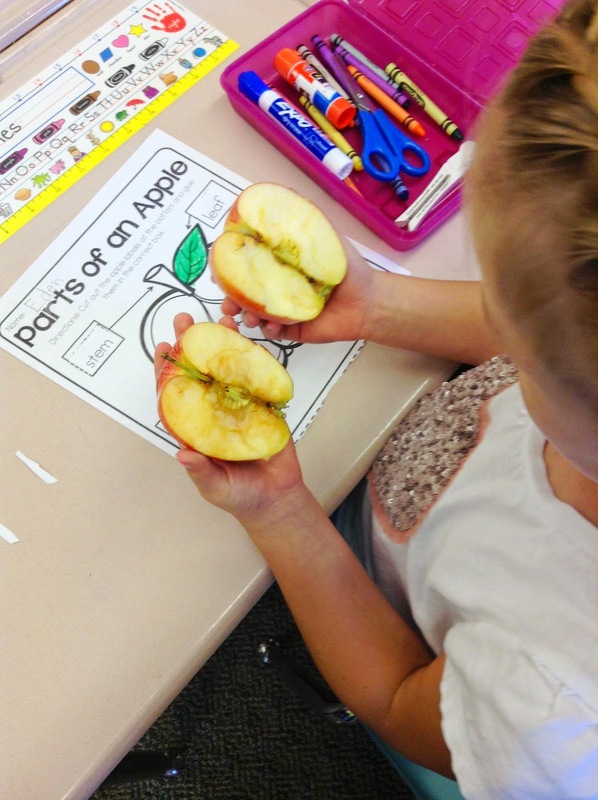 We chopped apples in half and observed and labeled the different parts of an apple. 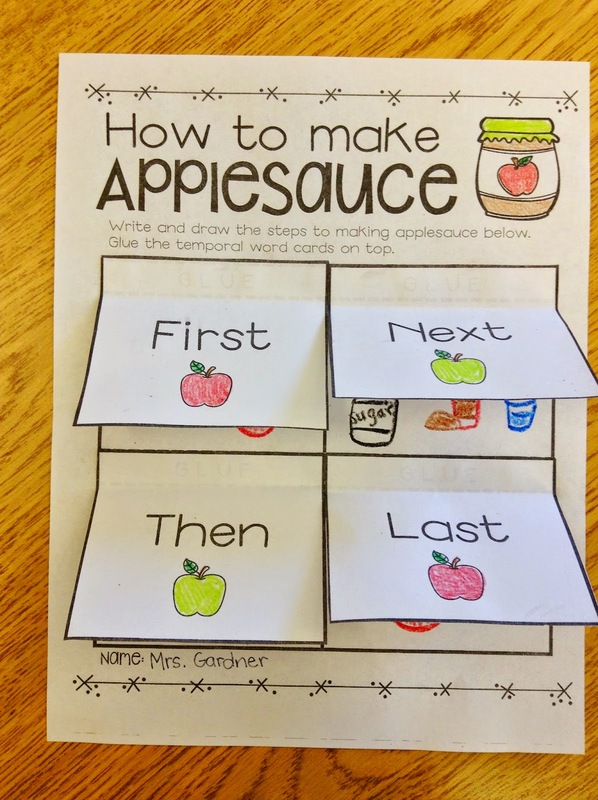 This labeling page is from my All About Apples packet, here. 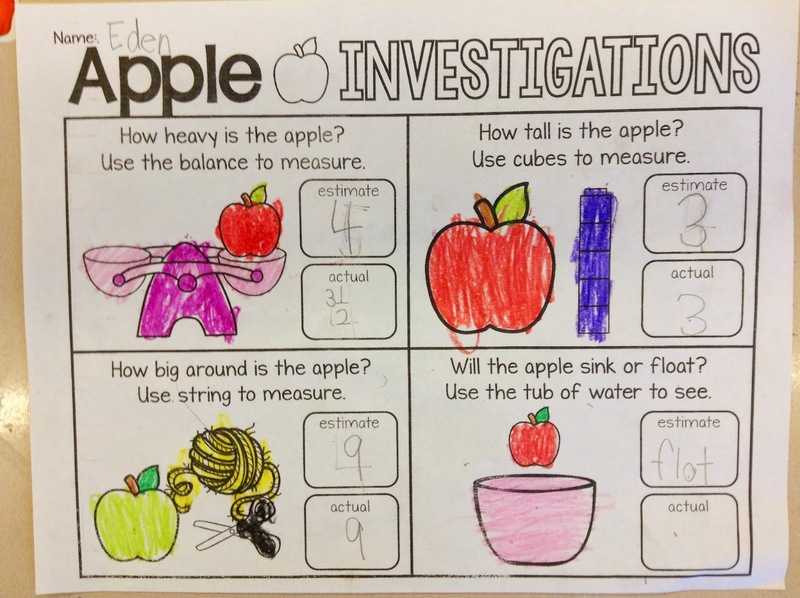 We continued our investigations by weighing apples, measuring the height and circumference of apples, and of course, answering that age old question...Will an apple sink or float? My kids were quite surprised (and excited) with the result! We made estimates and recorded our findings on this paper I threw together at 10:30 last night...you can grab it for free here! 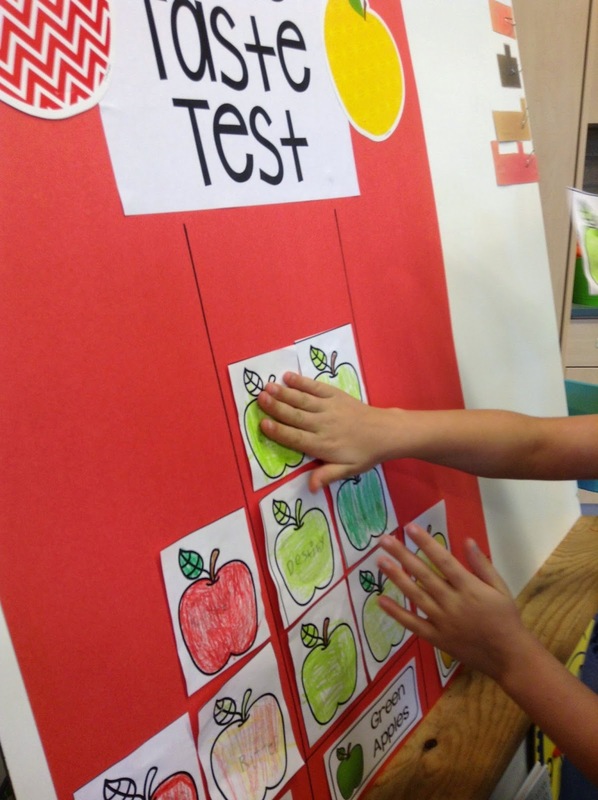 I tried to fit apples into our regular curriculum for the week just about everywhere I could. 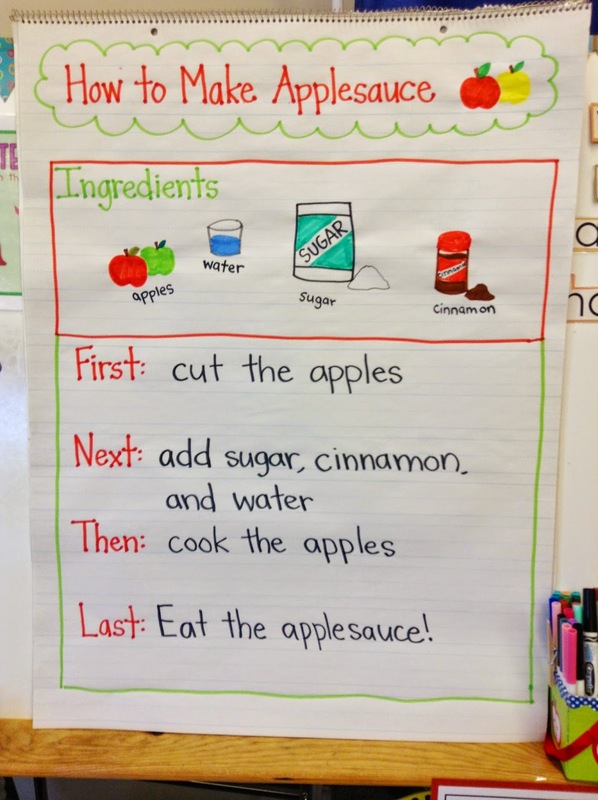 Any downtime we had was filled with fiction read alouds about apples and adding to our K-W-L chart. Based on their new-found enthusiasm for apples, my students had a great week and I'm so pleased with any semblance of effective instruction. Yay, I'm not a failure! The golden (delicious) climax of the entire week was when we made applesauce. I was so impressed that every single one of my students remembered to bring in an apple to contribute. I took this as an opportunity to make my room smell great introduce the concept of "how-to" text. We read and discussed the various steps with this anchor chart. 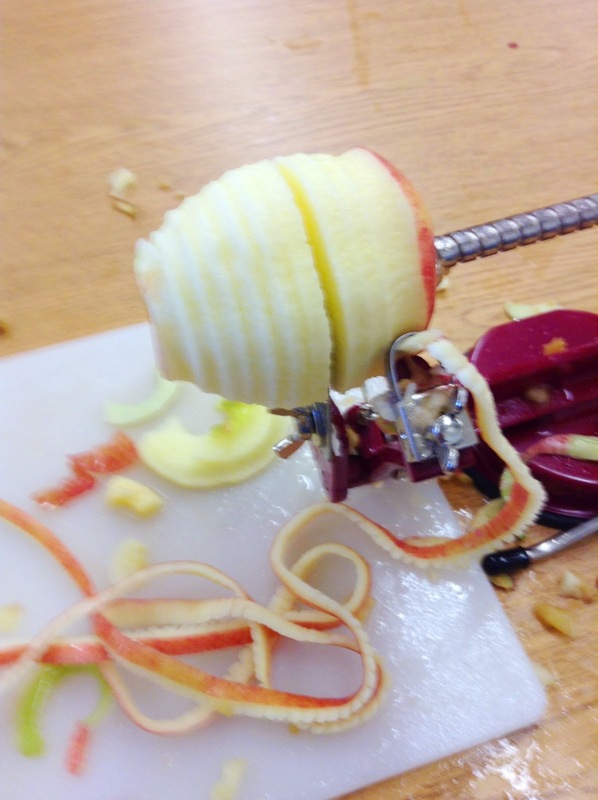 While they worked on that I had small groups of students come watch me peel/core/slice their apples. They loved this. And I loved using this incredible spiraly peeler. Our apples were ready for saucing in no time. We tossed them into two crock pots (I have a pretty big class) with some water, sugar, and cinnamon and set them to cooking. I used this recipe. Every 45 minutes or so we opened it up and I let my kids take turns mashing it up and taking in that delicious smell! 4 hours later it was all done and ready. We served it up and it was delicious! 97% of the class thought it was amazing. The other 3% claimed a resolved aversion to applesauce...though they were eventually enticed to at least take one bite. We had such a fun time with all of our apple activities this week. 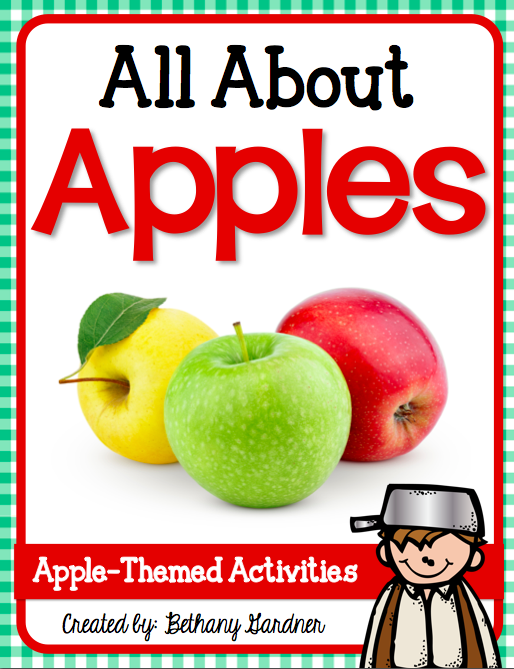 If you are looking for more apple activities for your class check out my latest packet, All About Apples! And while we're in the apple department, I just thought I should let you know that this is the most incredible scent to come out of Bath and Body Works! Honeycrisp Apple and Buttered Rum...it is as sweet and delightful as it sounds! 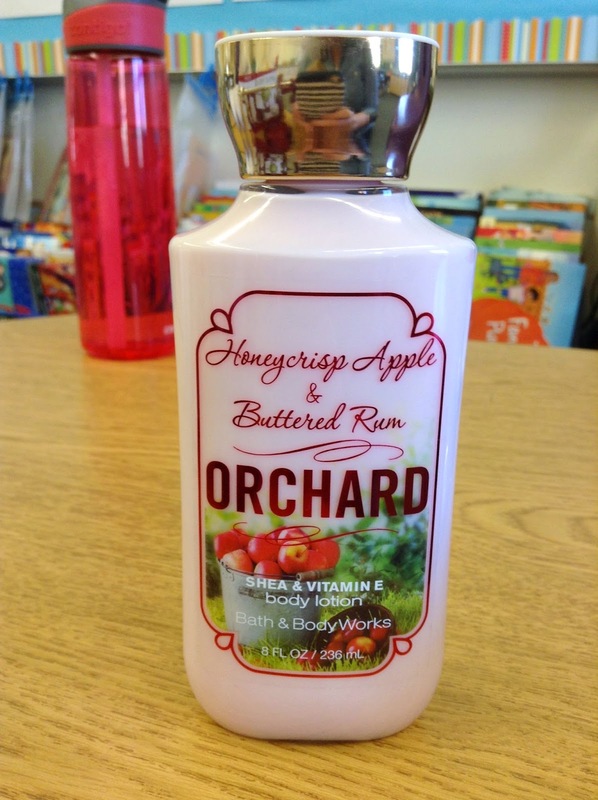 Kept this lotion at my guided reading table and used it all week! Great activities! Just started following your blog in Reeder!